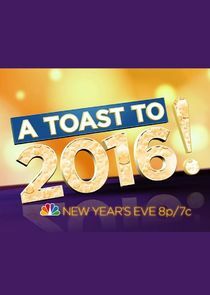 A Toast to... is a new NBC annual celebration of the past year that began airing in 2014. Kathie Lee Gifford and Hoda Kotb are kicking off the New Year's Eve celebration with "A Toast to 2016!" - the ultimate year-end look at the buzziest stories and events over the last twelve months. An all-star cast of celebrities recount the most talked about moments and mishaps that made for an unforgettable year. Hosts Kathie Lee Gifford and Hoda Kotb are joined by Arnold Schwarzenegger, Michael Bublé, Simone Biles, Dana Carvey and more to discuss memorable events of 2016.